Sql Server Error Log is very helpful to diagnose and troubleshoot problems. Error log files contain user-defined events and certain system events, which are very helpful for troubleshooting. In this article, I will explain various alternative approaches to find the location of the Sql Server Error Log file. Below image shows the Sql Server ErrorLog folder with error log files. Here ERRORLOG is the current error log file and remaining six files are the archived SQL Server Error Logs. By default sql server maintains six archived Error log files. Parameter 1: The log file which you want to read. Value 0 means current Error log file, 1 means the Archived Error log file ERRORLOG.1, 2 means the Archived Error log file ERRORLOG.2 and so.on. Parameter 2: This parameter specifies whether you want to read Sql Server Error Log file or Sql Server Agent Log file. This parameter value 1/NULL means Sql Server error log file, 2 means Sql Server Agent log file. Alternatively, you can go to the Sql Server Configuration Manager exe location as listed in the below table and then double click on it. In the Sql Server Configuration Manager as shown in the below image. Select the Sql Server Service and then right click the Sql Server service in the right pan and select the properties option. 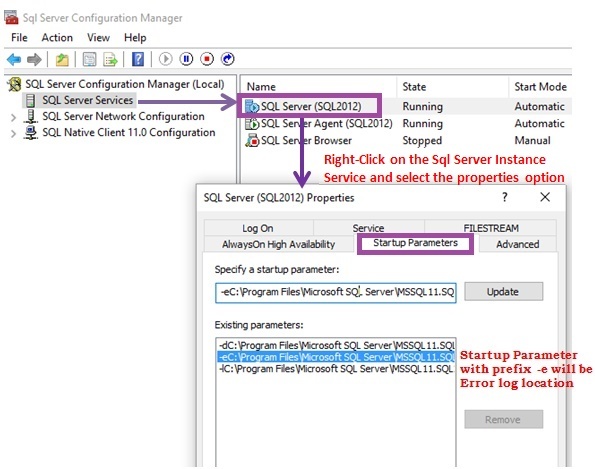 It will bring-up the Sql Server Service properties dialog, in the dialog go to the Startup Parameters tab. In the Startup Parameter tab, the existing parameter with prefix -e will be the location of the Sql Server Error log (i.e. the path appearing after the prefix parameter -e). If you are able to connect to Sql Server, then you can use the extended stored procedure XP_READERRRORLOG to find the location of the Sql Server ErrorLog file location as shown below. By the way the system stored procedure SP_READERRORLOG internally calls this extended stored procedure only. Parameter 5: Here we can specify the time, if we specify it will search the error log entries which are captured from this time. Parameter 6: Here if we specify the time, then it will search the error log entries which are captured till this time. Parameter 7: This parameter specify the sort order of the result, for ascending sort order we need to pass parameter value as N’asc’ and for descending sort order we have to pass this parameter value as N’desc’.